Samoa and American Samoa made the news a few months ago due to a devastating tsunami which ripped through parts of the islands. We can’t think of a better way to help rebuild than by moving there and investing your life in this charming island utopia! As far as places to move to go, you won’t find many places quite so close to paradise as Samoa. 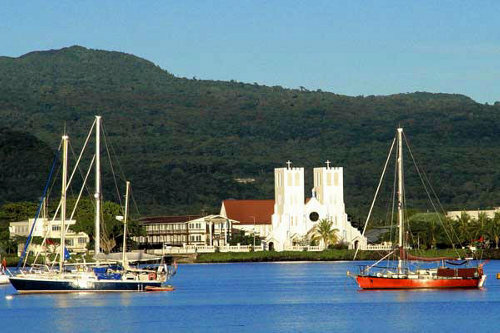 Apia is the country’s capital city and perhaps the most suitable home base on the islands. It is located on the northern coast of Upolu, Samoa’s second-largest island. Apia is really little more than a hub for exploring the rest of the island’s attractions, but it has all the accommodations you’ll need for getting by and getting around. Apia harbor is also a common docking station for cargo ships on their journey around the world, putting this quaint, rundown city smack dab in the center of it all, in its own little way. Things to do in or around the city include taking a walk along the sea wall (many Apians walk along the sea wall in the late afternoon, when it’s a bit cooler out), checking out the local flea market, going snorkeling at Palolo Deep Marine Reserve, and enjoying the air-conditioned Apia Museum. The city’s biggest landmark is probably the cathedral, something you can’t miss. And Mulinu’u, the old ceremonial capital, lies at the city’s western end, and is the location of the Parliament House and the historic observatory, which is now the meteorology office. For those interested in education, either for children or for adults, Apia is home to a number of pre-schools, primary, secondary and post-secondary institutions, including Samoa’s only university, the National University of Samoa. In addition, the University of the South Pacific School of Agriculture maintains a campus at Alafua, on the outskirts of Apia. Of course, there are also half a dozen bars in Apia and beer can be bought at any corner store. Believe it or not, but Samoa also brews some amazing beer (Vailima)– even the Germans think so, and that’s saying something (though admittedly, the Vailima brewery was founded by a German). If you’re looking to connect with other expats in the city, try dining at Apia Yacht Club. Despite the name, it’s totally a flip-flops and t-shirt type joint. All in all, Samoa offers some beautiful beaches, exquisite seafood, tropical climate, cheerful and friendly people, diving and stress-free living. Why wouldn’t you want to move here?